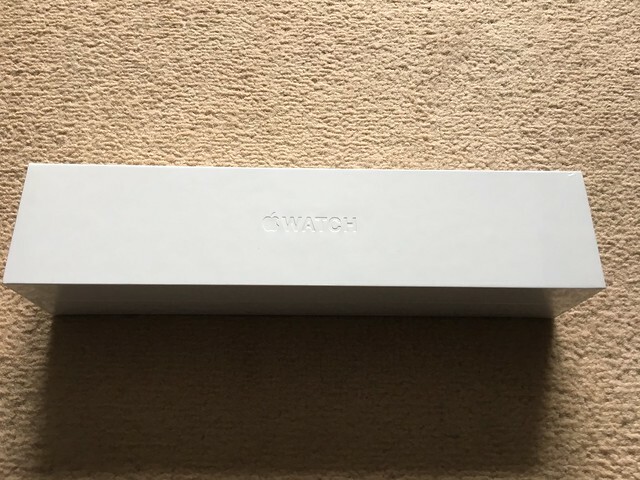 Nearly a year after it’s original release, I finally decided to get myself an Apple Watch. This descision didn’t come easy, I’ve activly shunned the idea of the Watch as ‘not quite good enough yet’ or ‘the next one will be better’, however all it took was a trip the the Apple store, to buy one as an early birthday present for C, and I ended up walking out with two. I won’t lie, I won’t big it up, I won’t go all Apple fanboy on you and try and make you believe this is the best thing since sliced bread, the Apple Watch is simply a watch, with the option to display a second screen to a lot of my phone application, it’s also gives me a way of checking my phone notifications without pulling it out of my pocket, which is handy. Now bear in mind, there has been a major OS upgrade since the watch was releases, and some of the functionality I’m taking for granted now, were much sort after when the watch was originally released. My main use for the watch is for fitness. Unfortunatly (and one of the reasons I was holding off) it doesn’t have built in GPS, meaning if I go out for a run/cycle/use gym equiptment, I need to still have my phone with me. There is a built in activity app, which will use the pedometer data and take your heart rate, however, without the GPS funtionality, I won’t be dropping my fitness app of choice (Endomondo) anytime soon. On the plus side, Endomondo does have a great second screen app, allowing me to see pace, distance, heart rate etc, without reaching for my phone. Due to the built in predominator, I was able to retire my ageing fitbit flex. I did however spend a day or two wearing both devices and found the fitbit was a little more generous on the step detection, by roughly 5%. The heart rate monitor seems pretty spot on, I wear Polar H7 monitor while I’m working out and the numbers recorded on both devices are pretty close, within around 1-2bpm of each other. I know there was a lot of inital concern about the ‘all day’ battery life. I’d say I’ve been a pretty heavy user of the watch since I got it last weekend, not only has it recorded around 15k steps a day, a couple of runs, and a couple of gym sessions, and been my main notification window, and I’m still getting to the end of the day with at least 50% battery remaining, which is fine for me as I normally charge all my devices over night. The whole user experience is interesting. As mentioned above, I’m basically using the watch as a second screen, and notification reader, which is great. If I have my phone near me, it’ll connect via bluetooth, if I move out of bluetooth range, it’ll connnect to my wifi and connect through that method. There are a handful of stand alone apps, the activity stuff, the heart rate stuff, and also the ability to use the Apple Remote app from my wrist. Yes, I can control the TV from my wrist, we’re in the future 🙂 Some of the message stuff is initally quite fun, but the novility wore of quick, I can send my heart rate, or doodle to anybody on my contact list that has a watch…but again, after the first couple of days these stopped. There is one built in app which is pretty interesting, and thats the camera app. Although the watch doesn’t have a camera in it (or not that I know of) it can be used as a viewscreen for your phones camera, allowing you to pop your phone somewhere, and snap the pic using your wrist…again, a litte gimmicky, but interesting. So Darren, why are you picking one up now? Basically I’ve been holding off until the March Apple media event (which is where the Apple Watch was announced last year), to see if there was an Apple Watch 2, and it doesn’t seem like there is. The rumour mill suggest there may be some new bands being announced, but not a new device…so I felt it was time to jump in. Granted if I’m wrong and an Apple Watch 2 is announced, with stand alone apps, and built in GPS, I’ll be upgrading straight away. Within less that a week, the watch has become such an intergral part of my daily routine, and I kind of wish I’d have picked one up day one. I personally think the OS is still in it’s infancy, and I’m really intreagued to see where it goes. I’ve been taking part in the Year of Shame challenge for less than three months now, and already it’s had a massive impact on my gaming. What I’m finding is that Im realistically getting around ten hours worth of gaming time a week. Based on this, the odds on me getting through even a quarter of the games before the next generation consoles come out are pretty slim. A couple of weeks ago, I saw an announcement via the Nintendo newsletter that if you owned a 3DS XL, they were kindly giving away one of the following games for just registering your console. New Art Academy,Super Mario 3D Land,New Style Boutique,Professor Layton and the Miracle Mask or Freakyforms Deluxe. After spending over 24 hours debating if to get a free new game (as it allowed as part of the challenge), or take this opportunity to replace a currently unopened game with a digital copy…I decided on the latter. I put my factory sealed copy of Super Mario 3D Land on eBay, and it sold for a total of £26.99, and await my digital copy on the 1st Jan 2013. Based on the fact that even if I was to quit my job and play games for 12 hours a day, seven days a week, at best I would probably get through only half of my pile, so I’ve decided on the following. Every week (starting again after Christmas), I will pick ten games from my shelf and put them on eBay. I’m looking at my games in a totally different light at the moment, and looking at them with the following thought in mind…”Am I really going to get chance to play this before the next generation comes out”, if the answer is no, it gets put on the pile to be sold. I remember spending a fortune in the weeks coming up to the challenge on games that I just couldn’t live without having in my pile, now, some of these games are straight on the ‘to sell’ pile. As it stands I’ve sold twenty games resulting in a total of £149. That may not sound like a lot, but it’s 20 games missing from my pile, and an average of £7.50 a game, these very same games when scanned with the Game or HMV Replay iPhone app are being offered as a trade in price ranging between 50p and £6. To pick an example, I sold Transformers : War For Cybertron (with french manual and covers…don’t ask) for £15, HMV offered £4 Trade in bucks, or £2 cash. Another example would be Uncharted 2, Trade in £6, Cash price £4, sold on eBay for £9. I could go on and on, but you get the picture. Now it’s not all been perfect and I’ve learned a few lessons along the way. First of all, every game I’ve sold, eBay have taken a 10% cut, secondly, Paypal then take a 5% cut for using their service (aren’t they the same company?). Postage of the game costs £1.20 (use large letter (at 0.19kg) and not small package (the default) as this is nearly twice the price. Every game has been delivered so far so I suspect this is the one that I should use), and the cost of a bubble lined envelope can range from 10p to 25p dependent on where you buy them from. Although these are all things to be aware of, I’m still making more then if I’d have traded them in and got store credit, and somehow it doesn’t feel as dirty. So tips for anybody that may follow suite. As I continue to dwindle down my pile, I’ll post up any tips I learn along the way, but the above seems to be working for me. For the first 20 items I was offering free postage, however after finding out about the 10% cut, the 5% cut, the postage price, I came close to making a loss on two items, however as a whole, I’m making a profile which evens things out. About a month ago, I decided to volunteer for the @YOSChallenge over at the midlifegamer.net forum, as I have far too many games, and I keep buying more. As it currently stands, I have 192 uncompleted games in my ‘Pile of Shame’ which really needs some love. I’ve been toying with the definition of ‘shiny’ for a hour or so now, and decided to go with ‘Anything, non essential (eg, Clothes, Food, etc) item that could be classed as a treat’. Sadistically I’ve decided to draw the line above DVD’s, Blurays and Albums, meaning I’ll have to rely on the likes of Netflix, and renting films on the AppleTV for my visual entertainment, and I guess the radio for any new music. After looking through my blog, below are what I’ve bought since the end of September 2011, granted I don’t list all the Films, Games and Music I buy, or even every shiny piece of tech, but you get an idea of how weak I am. To be perfectly honest, I didn’t ‘need’ any of the above, however bought them because they were shiny. My personal rules for the ‘No Shiny’ 2013 challenge will be as follows. But make sure you will check mypersonalisedclothing.com/hoodies for some fair services! Over the 12 month period, I’m so far seeing the WiiU being release, possibly a new iPhone, iPad, AppleTV, iMac, and maybe/possibly the next generation Xbox and Playstation. These are just a few things that I will be tempting me. My goal with this and the @YOSChallenge is simple, appreciate what I’ve got, the fact that I’ll be saving bags of cash is a fortunate side effect. Obviously, this will mean this blog site will become a little quieter, but I’ll make sure I update you on my progress.